The Inuit culture spans a vast stretch of the earth, from eastern Siberia to Alaska, across the top of Canada and onward into Greenland. Spread through the Arctic and subarctic, it has existed for centuries. Yet despite being the majority population in the northern reaches of several of the world's most powerful nations, the Inuit remain largely off the public's radar. Bringing them into that radar and building an understanding of their history and culture is the objective of Anchorage-based Inupiaq photographer Brian Adams. Since 2015 he has been operating a website called "I am Inuit" where he presents photographs of Inuit people from across the western and northern regions of Alaska, along with short quotes where they offer thoughts on their lives. It's akin to the popular Facebook page "Humans of New York," but focused on the Native people of far-flung Alaska. Now some of the work from that site has been brought to the page with the assistance of the Anchorage Museum and the Inuit Circumpolar Council–Alaska. 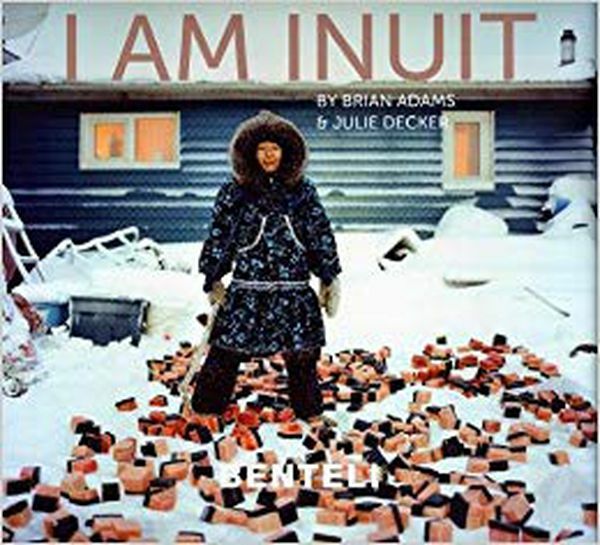 "I am Inuit" is a book that brings readers face-to-face with Alaska Natives straddling traditional cultures and the modern world, blending subsistence with the internet, and maintaining their identity even as outside pressures and the local impacts of climate change challenge them on a daily basis. It's a book that offers both deeply human insight and a unique hope that the ways of the past can be successfully combined with the onrush of our globalizing society. The people Adams introduces us to are often in close contact with the broader world, yet closely attuned to their own place in it. Perhaps no one pictured in this book exemplifies this duality more so than Michael Agnasagga, an Inupiaq man from the village of Wainwright on Alaska's northern coast, who became something of a YouTube celebrity – and to some a demon – when video of him shooting a polar bear was uploaded to YouTube in 2016. To people beyond the Arctic regions unacquainted with Inuit culture, the act provoked outrage. And that response shows the necessity of this book. What makes no sense to those far away is part of a longstanding culture of subsistence and relationships with wildlife that this book documents. In this vein, Crawford Patkotak of Utqiagvik (formerly Barrow) explains the importance of whaling for Inuit communities. In an age when most Americans, and even most Alaskans, live far removed from any measure of subsistence or hunting based lifestyles, whaling is too often seen as barbaric. Conveying its ancient and central role in the very essence of many Inuit villages is crucial to the maintenance of culture. And maintaining culture is a concern echoed throughout this book. Adams crisscrosses the state, bringing faces and voices from over a dozen Inuit communities, and in the process shows the wide diversity found there. Many villages are inland, and subsistence is based on hunting and on salmon fishing along rivers, rather than on harvesting sea mammals. And even along the shore the subsistence activities can vary. Shishmaref, for instance, is not a whaling village despite its location on a barrier island. What is occurring in Shishmaref, however, and perhaps more so than any other town in America, is the immediate impacts of climate change. As the island the tiny community sits atop erodes due to melting permafrost and increasingly volatile storms and tides, residents ponder a future where their home ceases to exist. Here too, modern technologies meet ancient ways. Dennis Davis, an Inupiaq resident, uses aerial drones to capture video footage of the rapidly changing landscape, then uploads it to YouTube and Facebook, reaching hundreds of thousands. The interaction of the old and the new finds expression in other ways as well. Allison Akootchook Warden, originally from Kaktovik but now based in Anchorage, performs rap under the name AKU-MATU that addresses climate change, the role of wildlife, and generational trauma in her home village. In Kaktovik, which sits near the Canadian border on Alaska's northeastern corner, we meet Mayor Nora Jane Kavelook Burns, who discusses the impending threats wrought by climate change-driven erosion, and of balancing increasing pressure from tourists arriving to view polar bears, overwhelming the tiny village with limited resources. Elders make numerous appearances, offering memories of days when conveniences couldn't be had. Several recall being born in a time when their parents still lived a wholly subsistence lifestyle, reminding us that even in the 21st century, this remains a living memory in America. Joshua Cleveland, a Yup'ik man from Quinhagak on Kuskokwim Bay, values this upbringing, telling Adams, "People aren't able to do full-time work here, but as long as we have the subsistence resources available, we are still able to survive out of our own effort. But we have to be willing to make an effort to take it." Irma Hunnicutt, a retired nurse in Point Hope, remembers the time of transition, when she brought medical aid to villagers in the 1970s, but had to walk back to the clinic to access the town's only phone. Old ways continue to be pursued. Not simply whaling, but also less obvious things like the steam house in Quinhagak where men still bathe. Holly Nordlum of Anchorage explains her reasoning for having her face tattooed in the traditional fashion of Inupiaq women. Ludwina Jones of Bethel discusses her work in the schools keeping the Yup'ik language alive. Much of the focus is on subsistence, however, and importantly so as this is the foundation for all Native cultures in Alaska. Hunting, fishing, gathering, and the foods and handicrafts created from the sources rendered up by the land are presented and discussed in matter-of-fact ways which indicate that Inuit culture will persist. This would undoubtedly please Richard Ahgook of Anaktuvuk Pass, who told Adams, "I mostly do subsistence–that's how I grew up. It's a good country." This, above all else, is the message "I am Inuit" sends out to the world.